Raith Rovers chairman Bill Clark is feeling ‘very positive’ ahead of this Saturday’s Scottish Cup fourth round clash with local rivals Dunfermline. Based on ticket sales thus far, the club is anticipating a sizeable crowd for the first derby since April 2017, and Clark is also expecting a rip-roaring cup tie. “It’s great for Fife to have two of our clubs facing each other in the fourth round,” he said. “It’s good to reacquaint ourselves with Dunfermline, and the appointment of Stevie Crawford adds a wee bit spice to whole thing. “I think both teams want to play attacking football so nobody will be shutting the doors and trying for a 0-0. 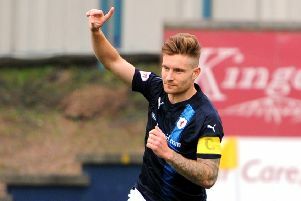 Clark believes Raith have nothing to fear from their local rivals despite the Pars playing at higher level in the Championship. “I dont think there’s that much difference between teams towards the bottom end of the Championship and teams at the top of League One,” he said. “Livingston and Ayr United have both shown that in how well they have done after getting promoted. “We’ve been underperforming a bit recently, but if our players are up for it, and play to their abilities, they will do well. The match is all-ticket and Clark has been pleased with the response thus far. “As it stands we’re looking at a crowd of between 5000 and 5500, and with a wee boost over the next few days we could go above 6000, which would be our biggest crowd for some time,” he said. Clark admitted he was disappointed that the fixture was overlooked for live TV coverage, particularly as the club would have stood to pocket around £80,000. “Maybe we’ll get chosen in the next round.